Choose between all fleece or a fleece top with a 100% cotton quilted bottom. 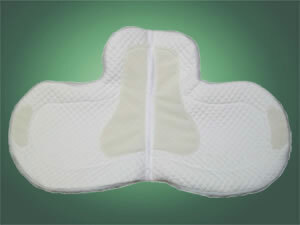 Each of the saddle pads below can be made using these specialized patterns. Sizes: Leadline, 14-14.5", 15-15.5", 16-16.5", 17-17.5", 18-18.5", 19-19.5", 20-20.5"
Our latest show pad, the Olympic Gripper. Super close contact is achieved with the 1/4"thick, small diamond quilted center. The fleece edge helps keep the saddle centered on the pad, while strategically placed gripper patches ensure no slippage against the horse or the saddle while still maintaining the sweat wicking abilities of the quilted flannel bottom. A contoured spine means that this pad will be comfortable for your horse. Here's video of owner Marvin Wilker talking about our newest pad, the Olympic Gripper Pad. 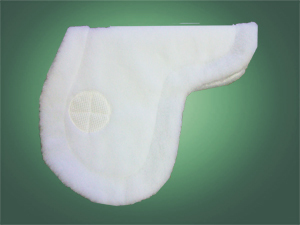 Our most popular show pad. A classic for the show ring. 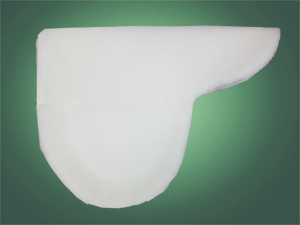 This pad offers an extra 1/2” of foam from pommel to cantle. 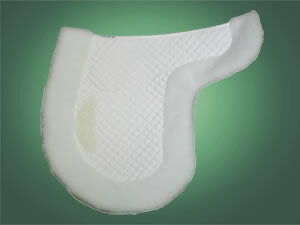 This pad offers an extra 1” of foam from pommel to cantle. The flap area is not padded to allow maximum contact with the horse. 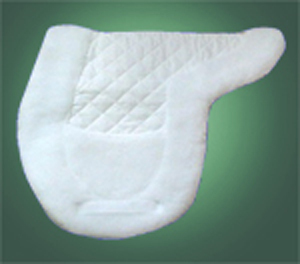 This pad has an extra 1" or 2” of foam (your choice) sewn into the cantle to build up the seat area of the saddle. This pad offers an extra 1/2” of foam from pommel to cantle plus a 2” foam cantle insert. It protects the horse’s back while lifting the cantle for the rider. 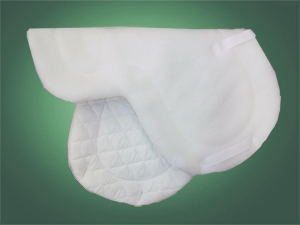 This pad offers an extra 1” of foam from pommel to cantle plus a 2“ foam cantle. This is our thickest pad, and it also protects the horse’s back while lifting the cantle for the rider. A unique combination of a 1/2” heart shaped foam panel from pommel to cantle plus an extra 1“ foam insert in the cantle area. This combination of foam protects the horse's wither while slightly lifting the cantle for the rider. 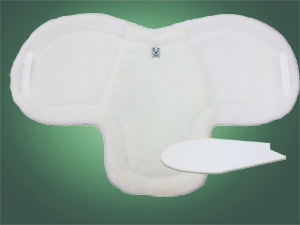 A very popular saddle pad for those riders who use gel pads. 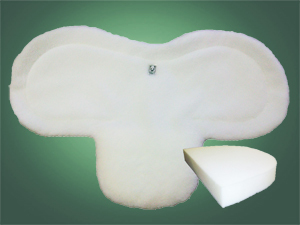 This pad has a wide velcro opening at the pommel that allows the gel pad to inserted and then removed with ease when the pad needs to be washed. 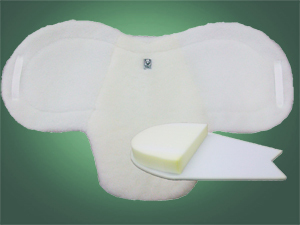 This pad offers an extra 1” in the pommel to give extra padding in the wither area. The flap area is not padded to allow maximum contact with the horse. The center of this pad is 1/2” quilted foam with a rolled fleece edge for a closer contact between saddle and horse. 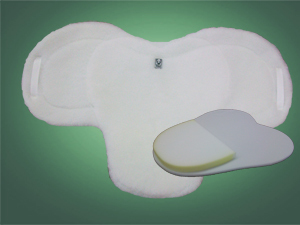 One of our best sellers, this "cling-on" pad features four unique gripper patches: two located on the underside of the pad on either side of the withers & two on the fleece top. 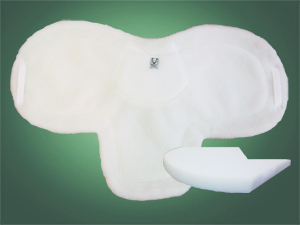 These gripper patches help hold the pad in place, making conventional straps unnecessary. 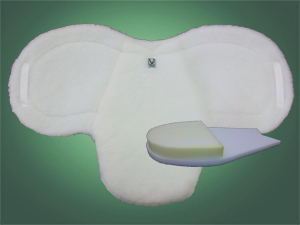 The Companion Pad, this fleece edged pad can be used along with any of our therapeutic pads for showing. 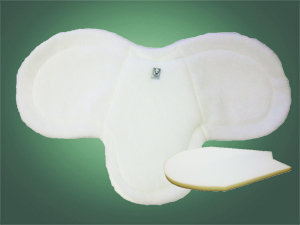 The quilted body comes in a variety of colors so you can coordinate with your baby pads and wither pads. See our Colors Available page for all the color choices we offer. 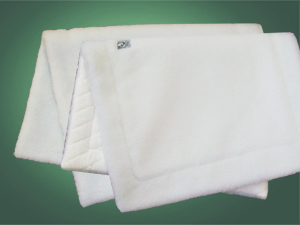 A square saddle pad available in either all fleece or a fleece top with a cotton quilted bottom. We offer any size combination, with standard sizes being 24"x24" 30"x30" and 24"x36".